Mining is used to extract resources from the world. Mining drills are the first step to automating manufacture, although most resources have to be smelted in a furnace for further usage. Mining speed is a function of the miner while mining time is a function of the metal or mineral you are currently mining (you can place a miner over a mixed field). The output of the unmodified resource is the percentage yield of the tile currently used by the miner. 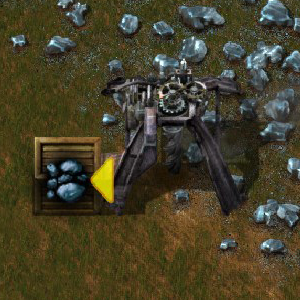 The mining drill or pumpjack will sum the production rate of all tiles below it and show that value in the tooltip. Note, that the Burner mining drill covers exactly its size (2×2, the covered area is also 2×2), while the Electric mining drill is one tile bigger (size is 3×3, but covered area is 5×5). Mining drills can only be placed on resources. 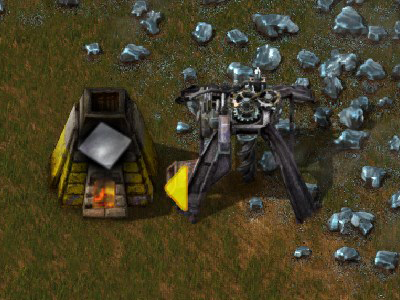 Unlike most other equipment, mining drills will output resources directly without the need of inserters. This includes transport belts, chests, other mining drills, furnaces, assembling machines etc. The above figures are modified by Mining productivity technology, which adds to any bonus from productivity modules. This page was last edited on 25 April 2019, at 10:23.